The DGA SP LineSquall is a revolutionary midrange driver that is slightly understable. It features a driver-like grip, smooth release, incredible speed and control for hyzer, anhyzer and straight shots. It will hold very long anhyzers, as well as any flip to flat lines. 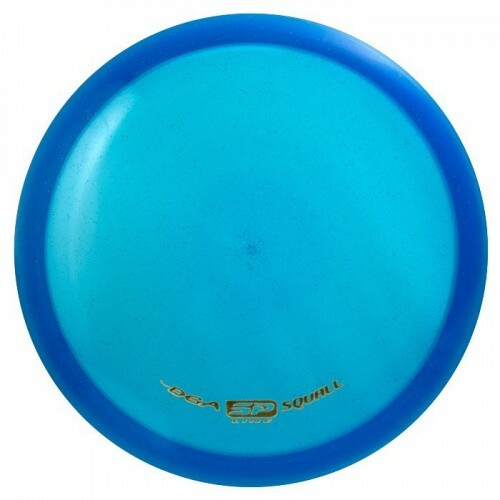 It is one of the fastest midrange disc golf discs on the market. The Squall will be your 'go to' utility disc! It will allow you to drive short holes and find the basket on challenging midrange shots as it holds its flight path like no other. Use it in almost any situation. This disc truly is a game changer and will make even then most seasoned players drop their go-to mid-range disc and pick up a Squall! Features - controllable mid-range driver, holds lines very well, high speed for mid-range class, smooth release. SP Line plastic takes a little longer to beat in than other DGA plastic blends due to its durability. The SP Line is DGA’s fastest plastic blend and produces slightly more stable flight characteristics. SP Line discs are transparent and have sparkle flakes suspended in the plastic.